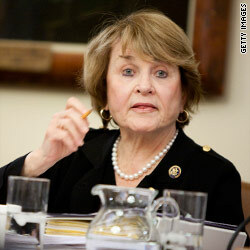 Rep. Louise M. Slaughter: The New York Democrat has had to add security to her office after receiving threats following the passage of health care legislation, WHAM-TV reports. More than 10 Democrats have reported incidents since the weekend vote, House Majority Leader Steny Hoyer told reporters. Steve Donahue and John Calipari: Cornell meets Kentucky in the East Regional NCAA semifinal at Syracuse on Thursday night, and sportswriters are having a fine time comparing and contrasting the two teams. Amanda Rose: The Canadian writer and activist created Twestival - or Twitter Festival. Thursday’s Twestival will involve local charity events in hundreds of cities around the world to raise funds for the estimated 72 million children who have no opportunity to go to school. In February 2009, the first Twestival Global was held in 202 international cities to support the one in six people in the world who don’t have access to clean and safe drinking water. More than 1,000 volunteers and 10,000 donors raised $250,000. Stuart Craig: Thursday is the day Warner Bros. Entertainment and Universal Studios are scheduled to reveal the date that the Wizarding World of Harry Potter will have its grand opening in Orlando, Florida. The Leaky Cauldron Web site is reporting June 18. Warner Bros. had announced that Craig, the 67-year-old production designer on all the "Harry Potter" movies, would lead the development of the 20-acre, multimillion-dollar theme park. The park will contain the village of Hogsmeade, the Hogwarts Express, the Forbidden Forest and Hogwarts Castle, among other attractions based on the books by J.K Rowling and the movies that followed. Ollivanders Wand Shop, according to news releases, promises to be “an incredible interactive experience where the wand chooses the wizard,” and a few hundred fan Web sites report that Craig designed the wands with Rowling’s approval. Craig has won three Academy Awards: for “Gandhi” (1982), “Dangerous Liaisons” (1988) and “The English Patient” (1996). Time Warner is the parent company of Warner Bros. and CNN. Not only are these, and, I'm sure, future incidents pathetic and unwarranted, but they don't help the international image of America that has improved dramatically since the previous administration. Rather than resorting to violence to "voice" their opinions, these people should be staging protests, writing/calling their Representatives and Senators, and exercising their fundamental right to petition the government for a redress of grievances. Not only are they breaking the law by throwing bricks through the windows of elected officials and sending threats, but should they be convicted of a felony, they may have just given up their right to vote. So when election time rolls around, these same people can't change anything because they can't vote. It is very sad that we have stooped to these levels of acting out. I am very disappointment how people are responding .... there's got to be a better way ..threats against family is a pretty serious thing if the table were turned how would the people feel.. What is becoming of America? There is No right ring conspiracy and there are NO code words by Republicans. right thing so will the American people. Did Democrats think we would all just lay down?